Thanks to Wylie Thomas for offering to share the PDF he prepared for the talk he gave at Oak Bay Park’s Healthy Trees, Healthy Communities Seminar that was held on Wednesday, October 24th, 2018. 7pm. Windsor Pavilion. Oak Bay. 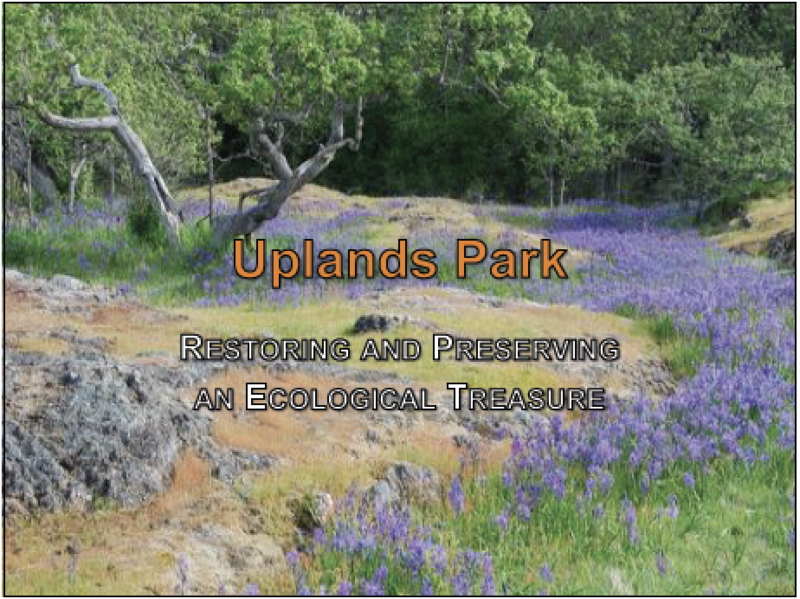 The PDF presents very beautiful photographs of Uplands Park and illustrates the challenges, restoration activities and preservation goals. 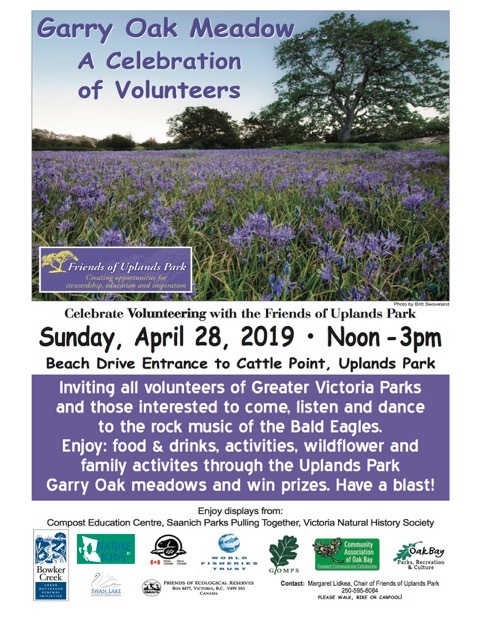 The GVGT is a partner with Friends of Uplands Park. They involve people from all over the Greater Victoria Area in helping to restore natural areas. 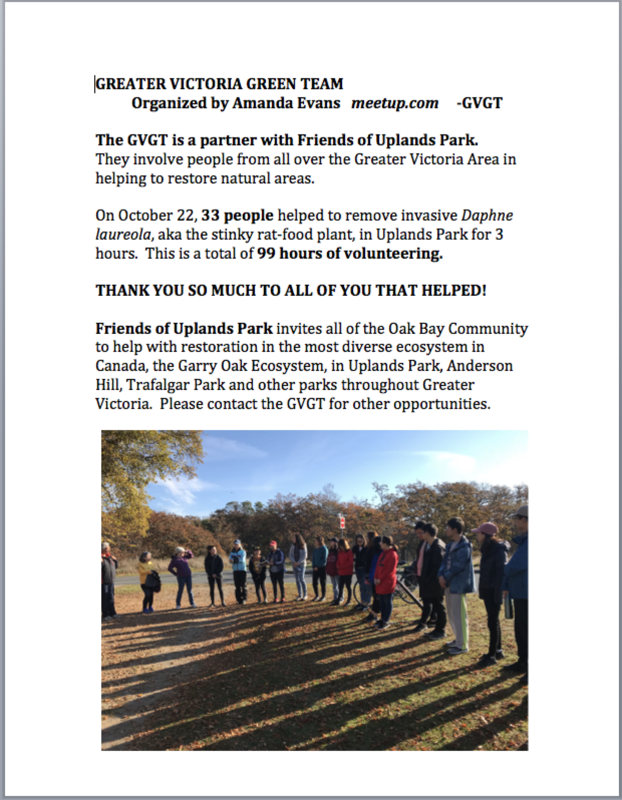 On October 22, 33 peoplehelped to remove invasive Daphne laureola, aka the stinky rat-food plant, in Uplands Park for 3 hours. This is a total of 99 hours of volunteering. THANK YOU SO MUCH TO ALL OF YOU THAT HELPED! 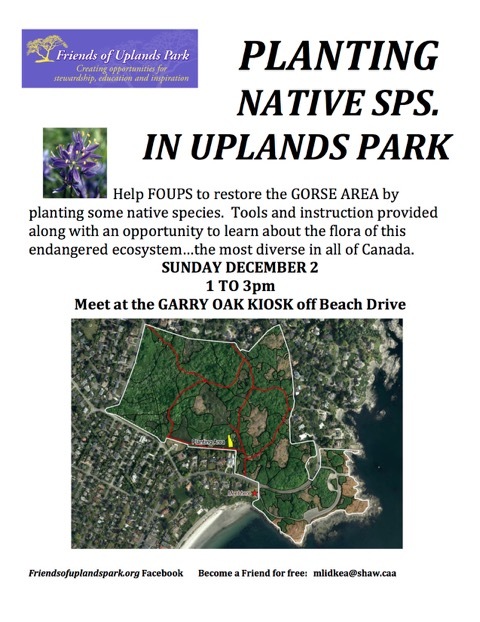 Friends of Uplands Park invites all of the Oak Bay Community to help with restoration in the most diverse ecosystem in Canada, the Garry Oak Ecosystem, in Uplands Park, Anderson Hill, Trafalgar Park and other parks throughout Greater Victoria. Please contact the GVGT for other opportunities. 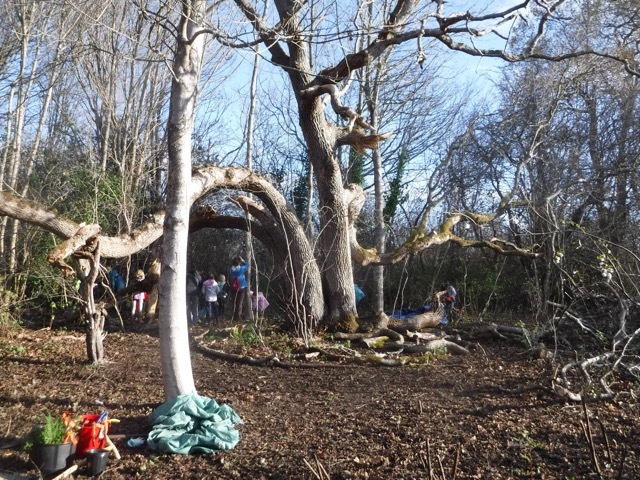 Grandparent Garry Oak Liberated in Uplands Park by Willows School Students and FOUP – The Story. Margaret Lidkea, Chair of the Friends of Uplands Park Society, recounts the story of the liberation of a Grandparent Garry Oak from invasive plants and the work of restoration of the ecosystem around this Garry Oak that has been accomplished by students from Willows Park working with the Friends of Uplands Park. An archival aerial photo from the 1920’s shows this oak and a nearby native Black hawthorn tree in a plowed field with no other plants. You can see how dark it is underneath, preventing plants that need light from growing. The trees surrounding the oak are invasive Norway maples whose canopy prevents enough sun from reaching the ground. The only plants underneath were English ivy and Daphne laureolaaka “Stinky rat food plant”. The big branch growing west covered the West trail. It was easy to see the smaller branch that grew NW down to the ground. We think it may have been a“Treaty Tree branch”. The 1st Nations, without a written language, had the tradition of sealing contracts or treaties by taking a branch of a young Garry oak tree down to the ground and placing a large rock on top so that it grew that way. There are 3 documented Treaty Trees in the Uplands and at least 1 other in another yard. In summer 2016, a big branch pointing south fell down. 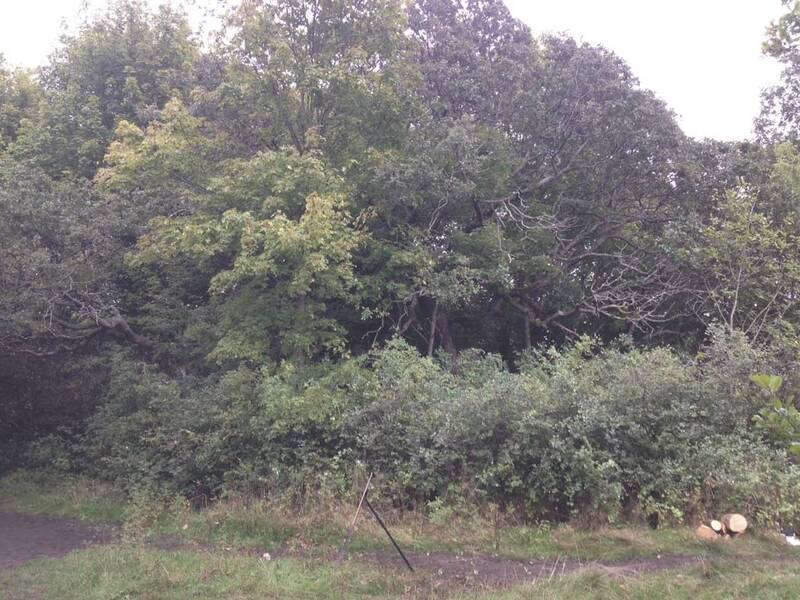 In the Fall, more of the invasive plants were removed. 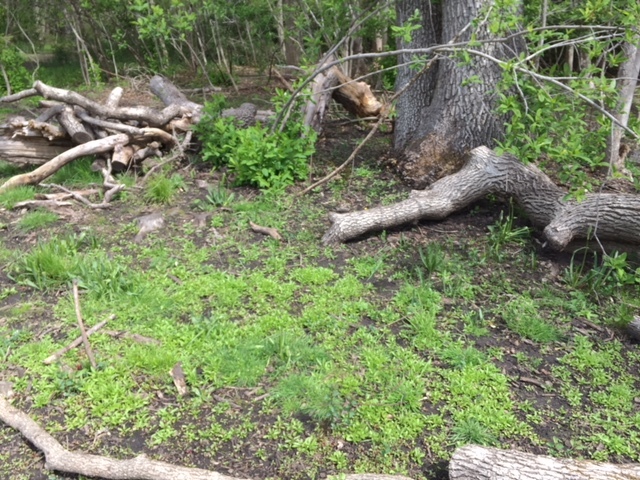 The stump from the branch that fell grew many twigs of oak leaves. Will it regrow? Summer of 2017, the biggest branch fell down and so did the Treaty branch. 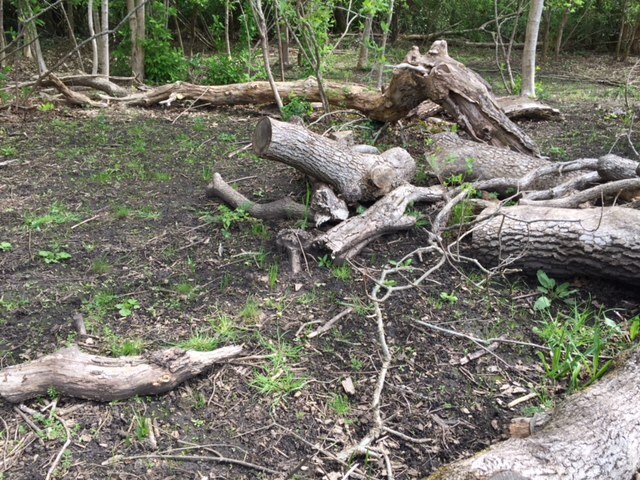 The branches were left on the ground to provide habitat for animals and also niches for plants. 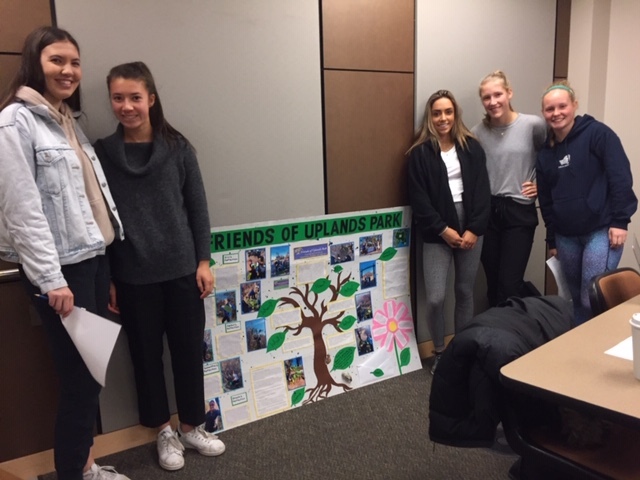 Fall 2017, more Willows School classes became involved in removing invasive ivy and also sawing down young Norway maple and English hawthorn trees. They also started to plant native species and scatter seeds. 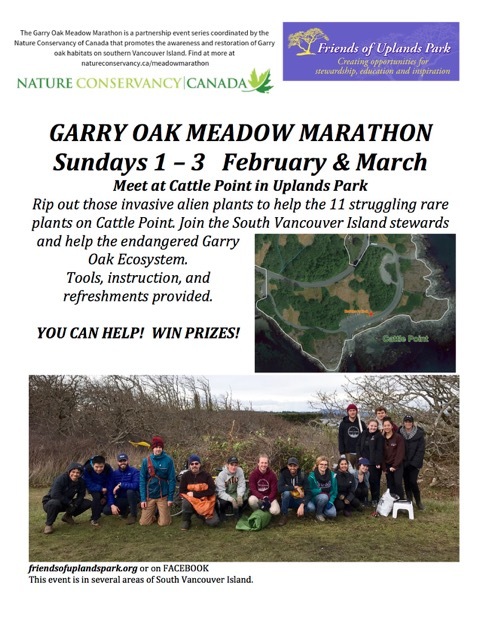 Students are creating a Garry oak meadow almost from scratch. Some of the green plants in the foreground are an endangered dense-flowered willowherb growing from seeds thrown by students. 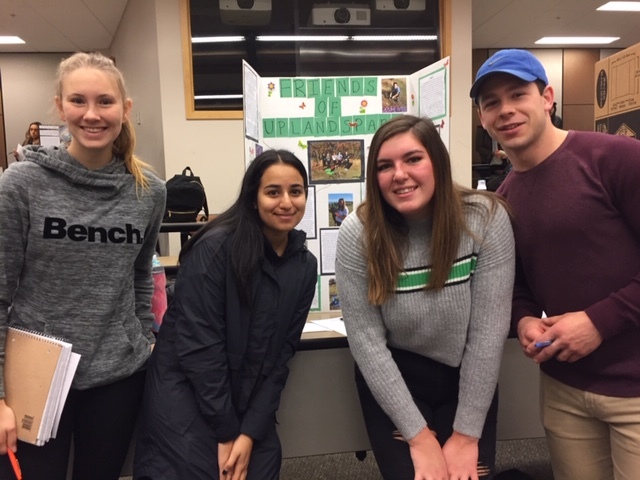 Fall 2018, about 20 Willows’ classes are removing invasive ivy, planting about $1500 of native plants purchased from Saanich Native Plant Nursery with donations, and sowing “seed bombs” made in class with seeds from native plants that will hopefully grow. 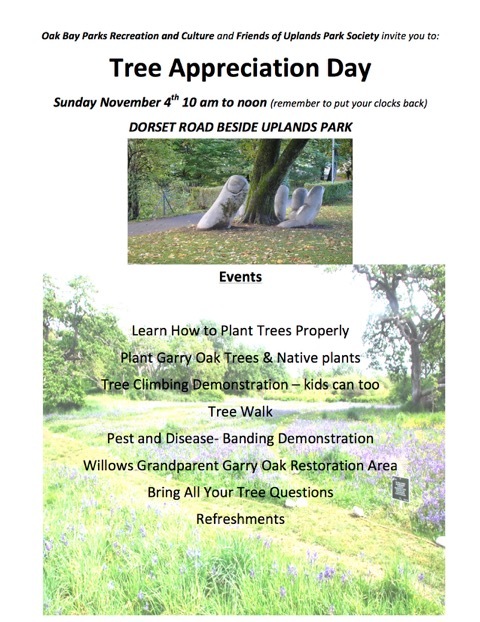 Margaret Lidkea, Chair of the Friends of Uplands Park Society, sends the following update on the Oak Bay Tree Appreciation in Uplands Park that took place on Sunday, November 4, 2018. Councillor Hazel Braithwaite welcomed a crown of very interested people to this annual event. 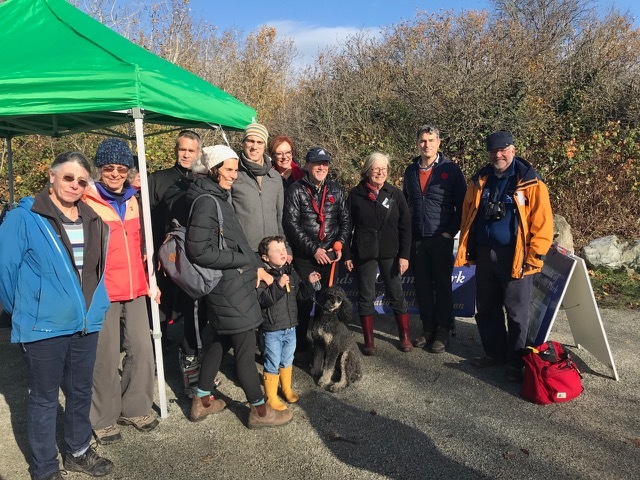 About 70 people attended: 25 went on Ron Carters neighbourhood tree walk, 7 on Wylie’s Uplands restoration walk and 35 helped Margaret in the Willows Grandparent Garry Oak area by removing invasive “stinky rat food plants” and English ivy, and planting native species. Many others planted Garry oaks with Chris Paul and Ian McLeod on Dorset and in the park, along with native wildflowers. Many kids loved using Louis’ equipment to climb up a Garry Oak tree. Many questions were answered by Manager, Chris Hyde-Lay, lots of coffee and juice drunk, and cookies and all the doughnuts were eaten. It was a very fun event! Photo, taken by Wylie Thomas, for Tree Appreciation includes Chris H-L, Mayor Kevin Murdoch, Councillor Hazel Braithwaite, Jacques Sirois, Christina Johnson-Dean and a member of the OB Parks Commission. The Annual Oak Bay Tree Appreciation Day. Sunday November 4, 2018. A beautiful brisk sun filled day in Uplands Park. 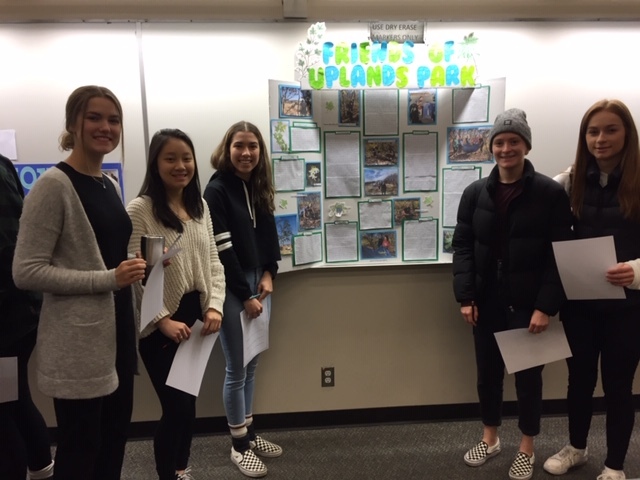 Councillor Hazel Braithwaite, Chris Hyde-Lay, [Manager Oak Bay Parks Services], and Margaret Lidkea [Chair of the Friends of Uplands Park], welcomed about 60 folks. Ron Carter, expert arbourist, took people on a walk to see some amazing Oak Bay trees. Wylie Thomas, who manages the Uplands Park restoration program, lead a tour of the work happening in Uplands Park. Margaret Lidkea, took a group to do more restoration work around the Willows School “GrandParent” Garry Oak, a 200 year old Garry Oak that has now been freed from invasive plants by the work of the students. Here are some of the photos taken in Uplands Park during Tree Appreciation Day. Photos by Kathleen Matthews who forgot her good camera so had to rely on her iPhone.